On July 25, 2012, life changed for Nick. As a pitcher at Lake Braddock Secondary School, Nick Balenger’s goals were on the mound throwing strikes, focus, and the right grip of the baseball. Nick experienced great success as a ball player with a recent state championship with Lake Braddock Secondary School and playing on the Virginia Shamrocks Showcase Team. The Balenger family headed to Hawaii for a family trip. The Balengers’ summer trip to Hawaii was supposed to be a homecoming, birthday party, graduation gift and family hurrah all in one, the last vacation they would take while the boys were still boys. On July 25, Nick misjudged the depth of the water while somersaulting into a wave in the Pacific Ocean. He hit sand. He suffered from Spinal Cord Injury. Paralyzed from the chest down, Nick had two surgeries to stabilize and fuse his spine, spent 19 days in ICU, and was eventually transported back to the East coast via air ambulance. Nick has new goals today. He now spends his day focused on moving his toes, lying flat on his stomach, moving his fingers and standing up. And we are thrilled to be bringing him home this month. 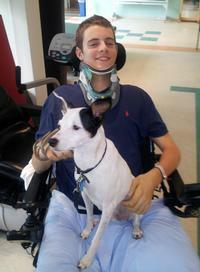 Nick has made great progress since his accident July 19th. He has a long road ahead of him and needs your support as he embarks on his journey through rehabilitation. Our favorite word to describe Nick is UNBREAKABLE. Nothing is going to stop his recovery. Be part of NICK NATION and join to cause! To assist with the immense challenge of financing these new and unexpected expenses, a fundraising campaign in Nick’s honor has been established with HelpHOPELive, a nonprofit organization that has been assisting the transplant community for nearly 30 years. In 2000, they expanded their mission to include those who have sustained a catastrophic injury. All contributions are tax-deductible, are held by HelpHOPELive in the South-Atlantic Spinal Cord Injury Fund, and are administered by HelpHOPELive for Nick’s injury-related expenses only. Nick is working harder than he ever has in his life. Please help us support him.